My goal for this assignment was to engrave an “S” into a coin. At first I thought I might want to carve my own coin from aluminum but once I realized that I couldn’t get the 90 degree angel’s I wanted from an 1/8th inch bit I thought it may be cool to carve into a Euro instead. I chose an “S” for my wife’s name Sadie. To begin, I fit my 1/8″ bit to the Othermill and then had to remember to download the Delrin custom tool library for brass because Euro’s are made of a combination of brass and nickel in the middle of the coin where I’ll be engraving. Once I put together the file for the Delrin rig in Vectorworks I couldn’t figure out how to export it as an .svg file in order to import it to Bantam. I asked around and realized that I needed to bring the file into Illustrator in order to re-save it….and then it took me a good 15 minutes to figure out what to export it as. Turns out you need to export it to an .eps file in order for Illustrator to read it. Once I did that it wasn’t entirely obvious whether I should keep the art board that automatically came with the .eps file once I imported it. After importing the .svg file from Illustrator I did not get what I expected in Bantam. After deleting the square I made outside the circle and adding a bit of a stroke to the circle constraining the art board to the size of the circle, I was able to get things looking the way they should. I set the advanced properties on Bantam Tools to cut in the inside because I feared that leaving the settings as they were on default would cut the circle larger than I wanted. I’m having a lot of trouble getting the “S” to show up in the Bantam program. It seems like it’s only taking the art board because I’m getting an outline of the board but not the “S”. The problem was that it was saving as a text file which wasn’t being read properly by Bantam so I had to rasterize the S to make it an image in Illustrator. I resized the image and set the engraving so it would engrave the middle. Of course I took the jig off the bed which entirely ruined the point of making a jig so I quickly put it back and made another circle on the other side of the Delrin so I could make a precision “S” in the coin. I’m pretty happy with the results although I would have liked it better if it didn’t make a crazy noise and I had to stop it 3/4 of the way through the process once I stopped it to clean the debris. I tried making it again with another 2 Euro but it immediately sounded bad once the bit hit the material so I halted production. 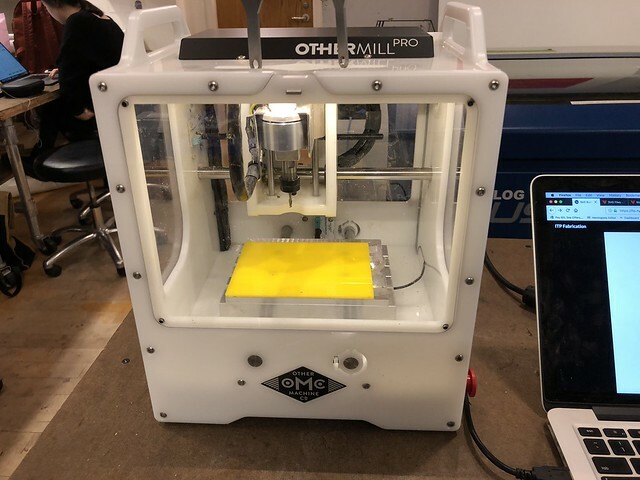 I really like using the Othermill and could’ve spent many more hours experimenting with it if I didn’t have to share the machine! CNC Milling a 2 Euro Coin from Marco Wylie on Vimeo. Using this small mill machine was a lot of fun once I was able to figure out how to use it! Initially I wanted to make an Ace of Spades card out of the yellow acrylic but Ben pointed out the “A”s were too small for my bit to handle so I went with a lightning bolt and cloud instead. One mistake I think I made in the process was creating a 1 pt stroke around my cloud and lighning bolt which made the line way too thick. As a result, my final piece came out really rounded and you can see how thick the line was cut out when I put the cloud piece back in the spot it was taken out of (see picture in album). I certainly learned a lot and next time I’ll be more careful about how I put together my illustrator file. The video documentation is sped up 300%. I found the icon through google images here and separated the lightning bolt from the cloud in illustrator to load it into the Bantam program. 2.5 cnc machine from Marco Wylie on Vimeo.